You can have a delicious meal in 20 minutes and all you need is shredded cabbage, a little butter and whipping cream. 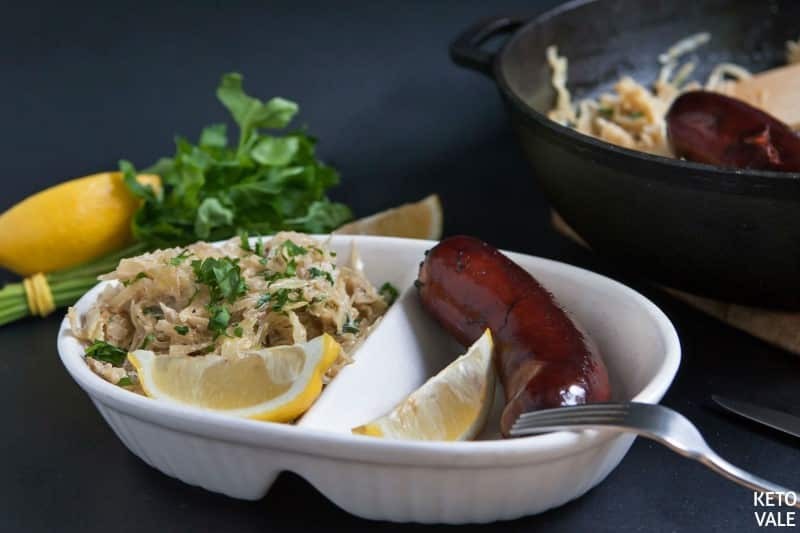 This creamy cabbage side dish can be served with any type of meat that you like. 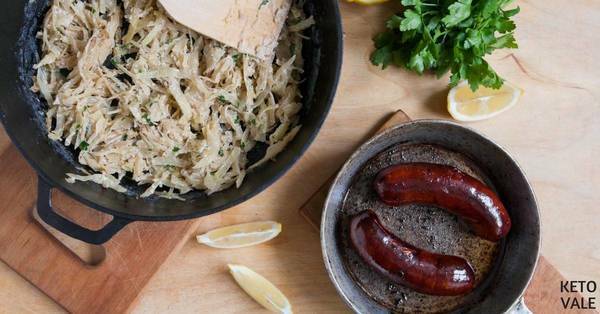 We use sausage for this particular meal. However, feel free to try different combinations such as chicken, pork, or beef. When choosing sausage, make sure it’s 100% natural without sugar, preservatives or nasty fillers. The macros of sausage will depend on the type and size you choose. 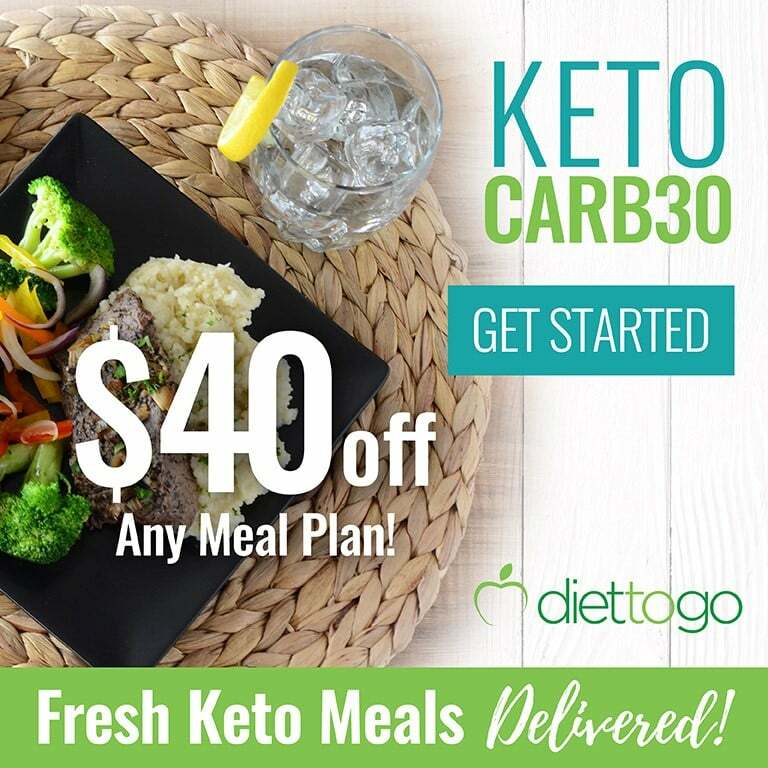 You can even make homemade sausages, this will be the best keto-friendly option. There are many tutorial videos on YouTube to show you how to do this. 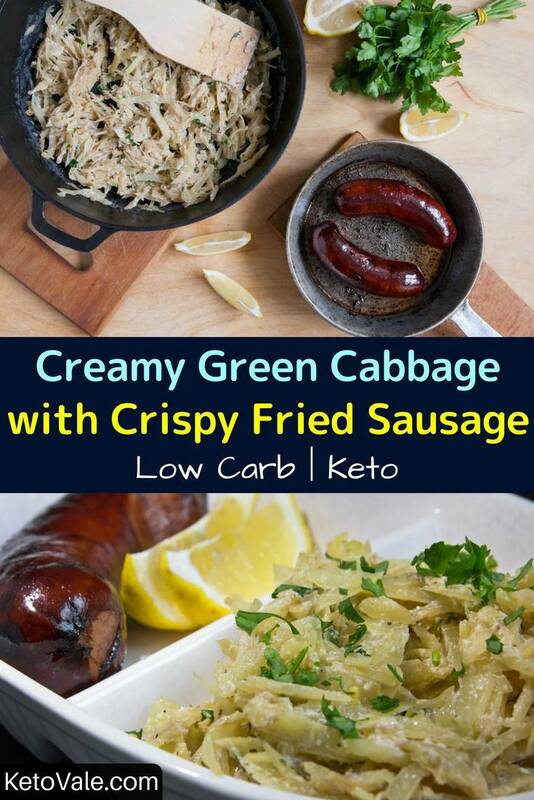 Crispy fried sausages make a perfect combination with soft and creamy sautéed cabbage. 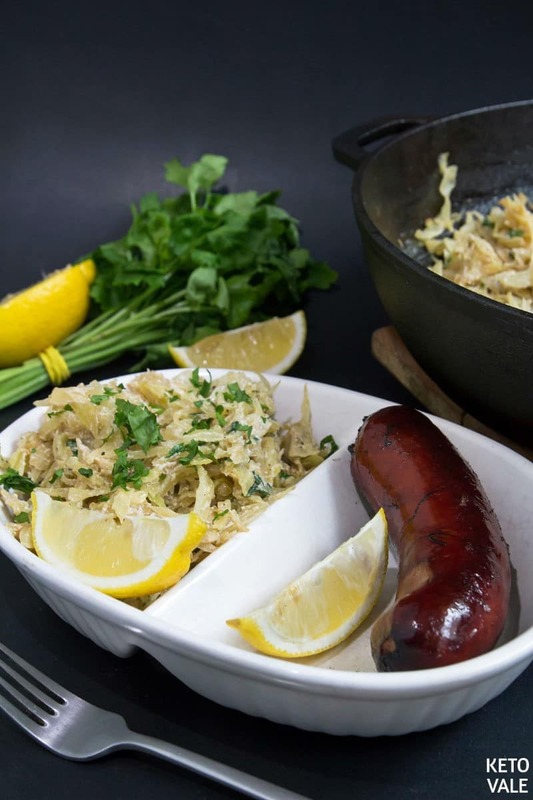 Simply fry sausages in a 1/2 tablespoon of butter until it’s crispy and cooked through then prepare the cabbage side dish. 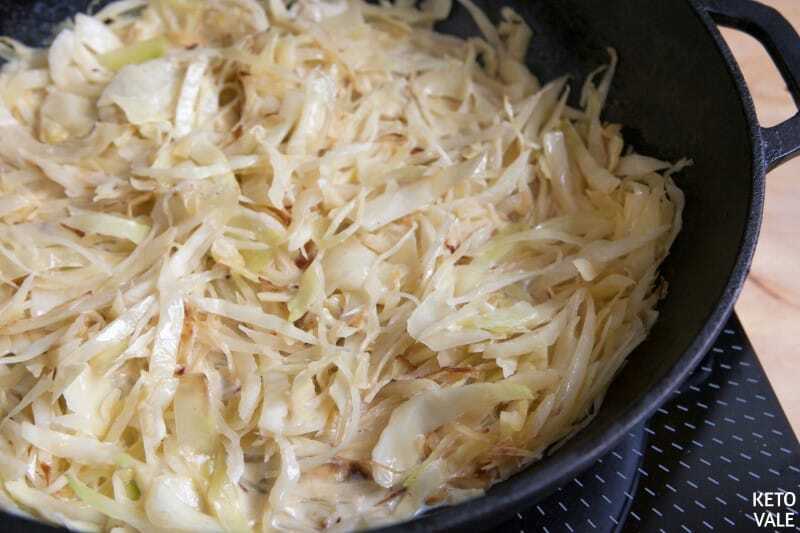 Over high heat, saute the shredded cabbage in butter. 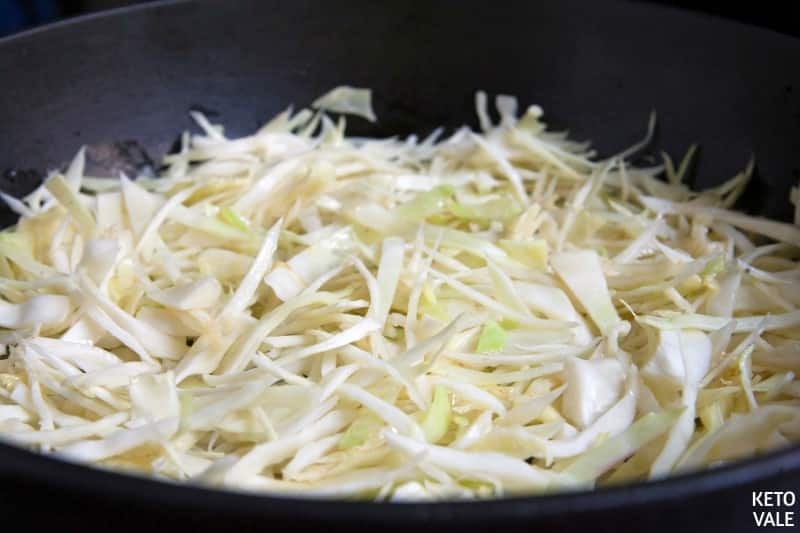 Stir the cabbage occasionally and cook until the edges are golden brown. Pour the heavy whipping cream into the pan with the cabbage. After this comes to a light boil, reduce the heat and allow the cabbage to simmer to reduce the cream. Sprinkle with salt and pepper as desired. Scatter with the parsley and lemon zest. This is best served with your favorite meat. Set a large frying pan over medium heat. Melt some butter and sauté the shredded cabbage. Stir the cabbage every now and then and wait until it turns golden brown around the edges. Pour the heavy whipping cream around the pan and bring to a light boil. Lower the heat and let it simmer until the cream is reduced. Add some salt and pepper to taste. Top with lemon zest and chopped parsley. Serve with your preferred meat.